Photograph shows interior view of Dominion Bridge Company during World War 2 munitions retooling, workmen at work stations in shot. Date of photograph is approximate, ca. 1940. - Description (on verso): Varnishing and final inspection 4.5 Honitzers. 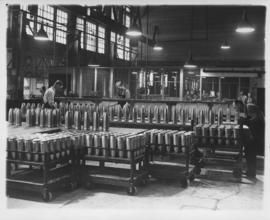 Photograph shows interior view of Dominion Bridge Company during World War 2 munitions retooling, workmen standing by conveyor belt and boxes of shell cases posing for shot. Date of photograph is approximate, ca. 1940. Photograph shows interior view of Dominion Bridge Company during World War 2 munitions retooling, workmen packing in shot. Date of photograph is approximate, ca. 1940. Photograph shows Dominion Bridge Company during World War 2 munitions retooling, workers at melting furnace in shot. Date of photograph is approximate, ca. 1940.